Can you believe I don't have anything in the color Olive?!? How I have gone this far without it?? Anyway, this weekend I was bound & determined to spend some time in Forever 21 because I'm constantly seeing great pieces of clothing from there featured on other blogs & on Pinterest, yet I've never really shopped there. So on Saturday I made a visit & tried on a few items, but walked away with nothing. HOWEVER, I kept thinking & thinking about a pair of pants that I had tried on & decided "why not!". They were a whopping $17.80 (regular price), so not a huge investment if I don't wear them a ton - I don't see that being the case though! So, my first clothing purchase from Forever 21 & my first pair of Olive Pants (or Olive anything)! I'm in love with this outfit & I think that's because it's not my typical style, which is incredibly refreshing! Also, my obsession of the week is Yellow accessories!! I have fallen hard for the versatility that this Olive color offers. It can be worn with so many other colors that the real question is - what doesn't it go with? I plan on wearing these pants with any shade of pink, corals & oranges, reds, yellow, lavender or deep purple. Not to mention your neutrals - navy, white, cream, grey, black & denim. Lot's of fun to be had with these combinations! Side Note: Forever 21 is not showing this color as on option so I listed the same pant in a different color as well as another Olive pant option. However, my local store had plenty in stock of both colors. Can we talk about these Cut Out Booties for a second. I just picked these up from Target on clearance for $17.48. I don't see them on the Target website, but you may be able to find them at your local store. I know it's somewhat silly to still be buying boots, but these cut out booties are a great item to transition into warmer weather...they'll be great with boyfriend jeans, skirts & dresses until things really warm up this Summer. The price couldn't be beat! I also purchased Revlon Just Bitten Kissable Balm Stain in Rendezvous after seeing this pin from Pinterest (click on the image to follow link). Thus far I'm quite pleased with both the color & the wear time. It's also a low cost investment if you're looking for something new. It definitely fulfilled my desire for a coral/orange-y lipstick for the Spring. I've also used some of the other products mention on the pin, & there are a few more I'd like to try as well. Overall I'm pleased with my Forever 21 experience & plan on visiting more regularly. The store we have here is quite large, so it can seem intimidating, but just go in with an open mind. You may walk away empty handed, or you may find something great! P.S. I previously used this shirt on this post, Shanna just talked about her love of Forever 21 here, & Gina just talked about her new Olive Skinnies here (Monday's post). Oh hey, thanks for the shout-out. :) I was just in F21 yesterday and also came out empty handed! It gets sooo overwhelming! I'm like you- I see so many cute things on other bloggers so I go in...but I need help sorting through that place and I do best if I have a specific item in mind. 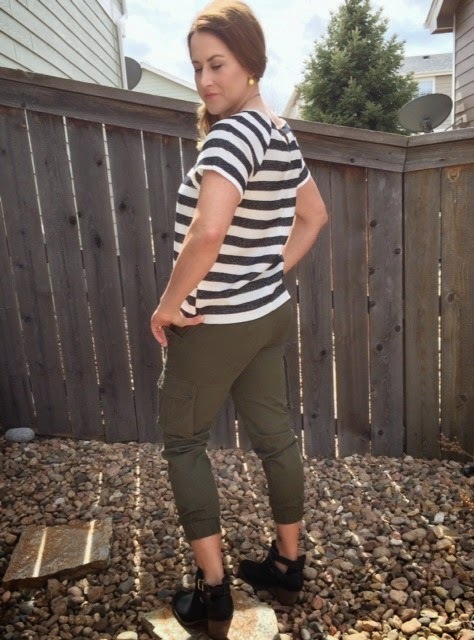 Love how you styled your olive skinnies with stripes and I HAVE THE SAME BOOTIES from Target! They only came out in maybe December? I'm sad that they already clearanced them out because they are great. Maybe they'll bring them back next year. Anyway, glad we are in the olive cargo club together so I can steal all your ideas! Hi Kellie. I am new to your blog but I am glad I found you through the link-up from Alison's page. This Outfit is so cute. 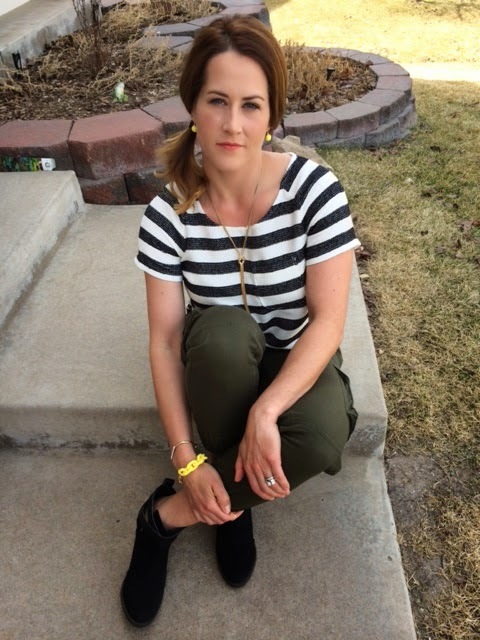 I love my B+W Striped Tees and Olive Skinny Pants. I am wearing something Nautical Inspired today, too. You look adorable and I really like those boots. I agree about the chaotic status of almost every F21 store. Yep, I can't do it (usually). Look at you!! I love this! I would totally wear this! And you look gorgeous and sassy and perfect! a) wow, cannot believe this is your first F21 purchase. b) the revlon lip stain is def my new favorite. To be honest, I haven't bought drug store makeup in, well, a really long time, except for the two revlon balms that I have - they're amazing. c) I agree that olive goes with everything! I never think to wear it though! I need to get it in my normal rotation!! Love those pants! Thanks so much for stopping by EPWL!